Twitter Bird - Trick or Tweet! "Trick or Tweet!" 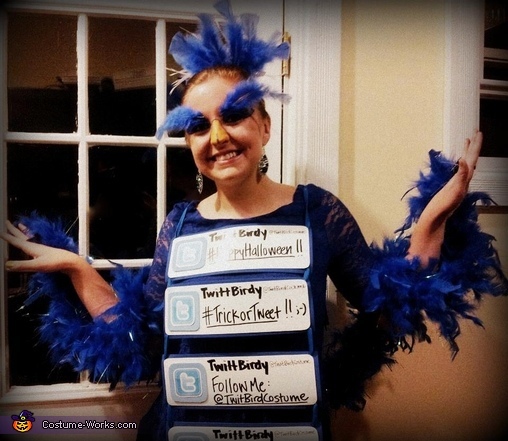 My Halloween costume a few years ago was the Twitter bird! I wanted to do something with a social-media theme, and thought this would be a lot of fun. To pull off the bird look, I bought a lacy blue dress and a matching feather boa and leggings, then wore bright yellow rain boots as my bird feet. For makeup, I colored my nose yellow for the beak, and accented it with dark eye-liner. I had silver/blue eye shadow, bright blue fake eye lashes, and then I glued a feather to each of my eye brows. For accessories, I created a feather hair piece for my head, and wore sparkly blue earrings on my ears. To make me look like the TWITTER bird, specifically, I created a "News Feed" to wear over my shoulders that hung in front of my body. Using the Twitter logo, I created four Tweets (out of foam sheets and glossy white paper) that said "#HappyHalloween," "#Trick or Tweet! ;-)," "Follow Me: @TwitBirdCostume," and "I'm trending... #Halloween2012" And yes, I actually made a Twitter account for it, but unfortunately, nobody followed me, so I deleted the account! haha For a finishing touch, I had hanging on my back a sign that had the Twitter bird on it that said "follow me." The costume was a hit.